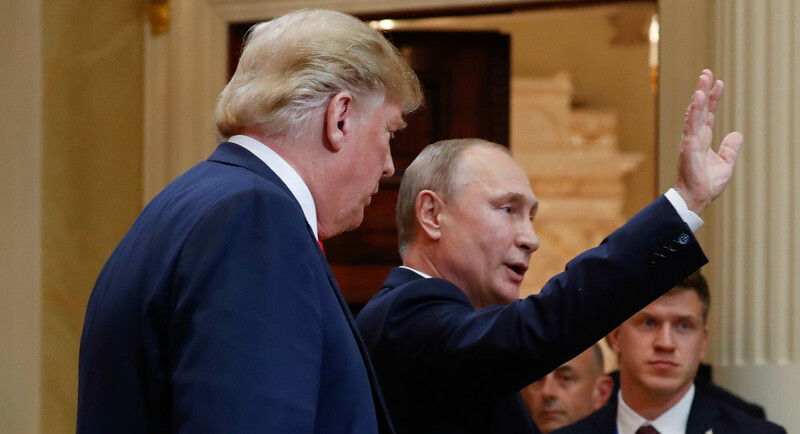 HELSINKI — Donald Trump and Vladimir Putin found one point of complete agreement: They both wanted Trump to win the 2016 U.S. election. Beyond that, however, the former reality TV star and the former KGB spy mostly talked past each other at their high-stakes meeting in Finland, with Putin preening on the world stage and Trump still obsessed with settling scores on the home front. From an optical standpoint, Putin scored huge PR victories at the joint news conference, portraying Russia again and again as a restored superpower with major influence around the globe. In other words, to use a Trumpian phrase, Putin proved he has made Russia great again. But the Russian president seemingly won nothing in the form of concrete concessions: No recognition of the annexation of Crimea; no rescinding of economic sanctions; no readmission into the G8; no recommitment by the U.S. to the Iran nuclear deal; no reversal of Trump’s opposition to the Nord Stream 2 gas pipeline; not even a firm commitment on new cooperation in Syria, which Putin had made a priority. But despite all the hyperventilating on cable news shows about how soft Trump was on his Russian counterpart, Putin went back to Moscow with nothing more than vague plans to create a “high level working group to bring together captains of Russian and American business” and to create “an expert council that would include political scientists, prominent diplomats and former military experts” in hopes of improving ties. For some, the lack of substantive achievements is a relief: Trump didn’t make any of the concessions some allies had feared. Trump, however, seemed less sure on both counts. But if Trump’s siding with Putin over the U.S. is remarkable, it was for the setting — standing alongside the Russian president — not for the content. Trump has said many of the same things before. Indeed, it is incredible — as in defying credulity: Russia continues to offer safe harbor to fugitives from the U.S., notably Edward Snowden, the former NSA contractor who was given Russian asylum after stealing a trove of government secrets and releasing them for publication. Trump, in the end, seemed to do what he always does: He sowed chaos and disruption while achieving little substantive change. A clear pattern can now be discerned: from his upending of the G7 summit in Quebec, to his mostly unproductive summit with North Korean leader Kim Jong Un in Singapore, to his threats and bluster at NATO headquarters followed by a reaffirmation of his commitment to the alliance, to his insulting interview in Britain, where he backtracked, hemmed and hawed and finally muddled through his visit. As with his hyperbolic claims in Singapore and at NATO, Trump declared a huge victory after his two-hour one-on-one meeting with Putin, followed by a slightly shorter working lunch with aides, at the Presidential Palace in the Finnish capital. At times, the far more experienced Putin seemed to be toying with Trump, who has little diplomatic experience and seemed ill-prepared for his encounter with the extremely disciplined Russian. Putin used his offer of law enforcement cooperation with Mueller’s investigation to pivot to a smearing of Bill Browder, a British investment banker who has led an international campaign to punish Russia for its human rights abuses. Trump said nothing as Putin accused Browder of criminal charges that Western experts have long dismissed as politically motivated. Browder’s lawyer, Sergei Magnitsky, died in a Russian prison and a U.S. law to punish Russia for human rights abuse is named the Magnitsky Act. The Kremlin and the White House had agreed to allow two questions each from Russian and U.S. journalists, and even there the Russians found a way to take a jab at the U.S. that Trump seemed to miss. Russia’s first question went to the Interfax news agency, but its second was reserved for Russia Today (RT) — the Kremlin-owned and controlled international television outlet widely derided in the West as carrying government propaganda. Trump, who repeatedly bashes U.S. journalists for “fake news,” made no comment about RT, and simply replied to the question about Syria. Putin also pivoted off questions about election meddling by Russia to criticize George Soros, the Hungarian-American billionaire and supporter of liberal causes. As with Putin’s other jabs, Trump offered no comment or response. Putin used a question about Trump’s opposition to the Nord Stream 2 gas pipeline to suggest the U.S. and Russia could cooperate on setting international energy policy. Putin flattered Trump, praising him for his outreach to North Korea, which so far has yielded no concrete concessions. While many American officials, including Republicans, slammed Trump’s performance, the president departed Helsinki seeming content for the main message of the meeting to be that, as far as he was concerned, relations with Russia had been reset. Tags: preens, Scores, settles, Trump, while, Путин.